Brain ischemia-reperfusion injury is a complex pathological condition that involves a cascade of events like excitotoxicity, peri-infarct depolarization, oxidative/nitrosative stress, inflammation, apoptosis, necrosis and autophagic degeneration. Since the past decades, researchers have provided significant information about the therapeutic potential and possible mechanism of action of plant extracts and derived chemicals to target multiple pathways of the ischemic cascade. 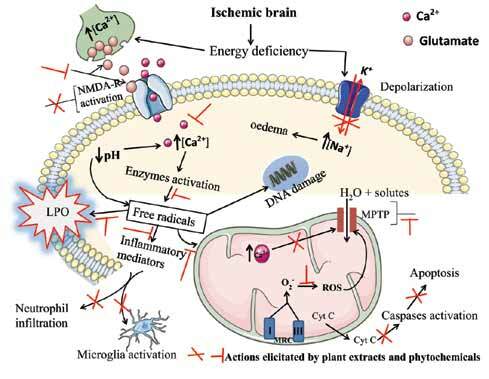 Here, we summarized experimental, clinical and epidemiological therapeutic interventions of plants extracts and phytochemicals against brain ischemia-reperfusion injury. Whether oxidative stress is the cause or consequence of brain ischemia is open for debate but details about oxidative burden and inflammation following brain ischemia are also described. Furthermore, the antioxidant mechanism of these extracts/ phytochemicals was reviewed. Although these plant extracts and phytochemicals showed the ability to act on the multiple steps of the ischemic cascade in in vitro and in vivo models of brain ischemia, further investigations are needed for their validation and for the development of new drugs. Brain ischemia/reperfusion, traditional medicine, ethnopharmacology, drug targets and neuroprotection. Centro de Ciencias Biologicas e da Saude-CCBS, Departamento de Ciencias Biologicas, Universidade Regional do Cariri (URCA), Pimenta, Crato-CE, CEP 63.100-000, Brazil., Departamento de Bioquímica e Biologia Molecular, Programa de Pos- Graduacao em Bioquímica Toxicológica, Universidade Federal de Santa Maria, Santa Maria, RS CEP 97105-900, Brazil.